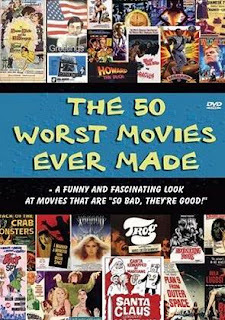 I have to admit, I’m a big fan of movie lists, so I was really looking forward to checking out 2004’s The 50 Worst Movies Ever Made, a documentary directed by Brandon Christopher. Sure enough, many of the films mentioned here are real stinkers. Everything you need to know about The 50 Worst Movies Ever Made is in its title. Counting down from 50 to number one, it starts things off with a bang, picking Ed Wood’s Glen or Glenda, in which the director himself played a cross-dresser, as the 50th all-time worst (this won’t be the last Ed Wood film to make the list). By presenting clips from the selected films, as well as some witty commentary by narrator Carlos Larkin, we’re given a brief glimpse into the reasons why these pictures are considered the absolute bottom of the barrel. A few titles were obvious choices, like Ishtar, Santa Claus Conquers the Martians and Robot Monster (even Howard the Duck is mentioned). But it’s the films I’ve never heard of that really sparked my interest, movies like Frankenstein Conquers the World, a 1965 Japanese import in which Frankenstein’s monster grows 50 feet tall and takes on an entire town, and Greetings!, a 1968 comedy with quite a pedigree (directed by Brian DePalma and starring a very young Robert DeNiro). And how is it I’ve never seen Hillbillys in a Haunted House, a film that stars Lon Chaney Jr., John Carradine, Basil Rathbone and country music legend Merle Haggard? That said, a few decent films also make the cut, movies that, while not cinematic masterpieces, were entertaining enough to have me scratching my head, wondering why they were included here (Black Belt Jones, starring Jim Kelly, shouldn’t be on anyone’s worst list). Fortunately, The 50 Worst Movies Ever Made is presented in such a breezy, fun manner that I was able to take errors like this in stride.